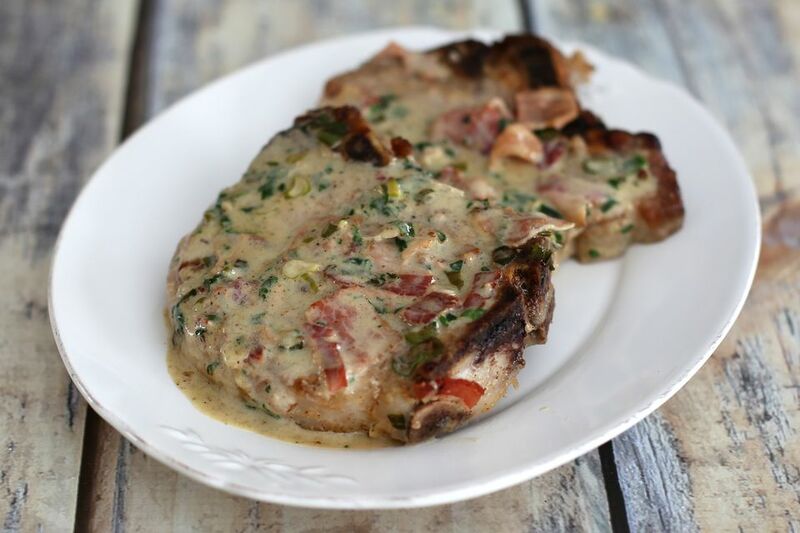 These easy skillet pork chops are served with the creamy bacon and Dijon mustard sauce. The simple, flavorful pan sauce is made with heavy cream, wine, and a small amount of Dijon mustard. The pork chops are easy enough for an everyday family meal and they're fancy enough for guests. Cook the bacon over medium heat in a large skillet for about 4 minutes, or until partially cooked, not crisp. Remove it to paper towels to drain and cool. Combine the diced bacon, wine, and green onions; let stand for 20 minutes. Drain and reserve the wine in a cup or small bowl. Set the bacon and onion aside. Season the pork chops with salt and pepper then dredge in flour. Heat the butter over medium heat in a large skillet. Brown the pork chops for about 5 to 6 minutes on each side. Add the bacon and green onions to the skillet and continue cooking for about 3 minutes. Add the reserved wine and cream to the skillet. Reduce the heat to low, cover the pan, and simmer for 10 to 12 minutes, or until chops are tender and cooked through. Using a slotted spatula or tongs, remove the pork chops to a warm serving plate. Simmer cream sauce for 2 to 3 minutes longer, until reduced and thickened slightly; add the Dijon mustard and parsley to the sauce and heat through.